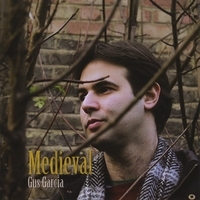 Gus Garcia – Medieval EP release is a mixture of soft acoustic driven and lively songs that will last in your memory long after hearing these four tracks. Clocks & Crocodiles is the first track, which is a lively and uptempo song dealing with not wasting time with tales of dreams. Getting the more lively aspect to Gus Garcia’s music begins in the second track Rhythm. Showing the vocal talents of Gus Garcia is prevalent in this subtle track, Two for One. Probably the best song on this EP is Medieval, a mixture of acoustic and soft rock elements that builds around the song. The Sailor is a rather melancholy song that starts with a slow piano that goes through until it gets quite experimental with sounds reminiscent of the waves of the sea, and adds to the story and tales of the high seas.